Our 7/12 A-Frame "Cape" one-story two-car build-on-site garages are available from 20 feet by 20 feet all the way up to 24 feet wide by 32 feet deep and are built to last with solid wood construction and Duratemp siding with your choice of paint and trim colors. 20' wide garages come with two 8' x 6'6" carriage-style garage doors with sunburst and 24' wide garages come with two 9' x 7' carriage-style garage doors with sunburst. 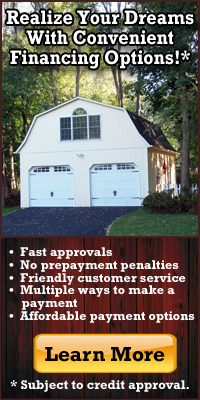 Each garage is hand-crafted in the United States by expert Amish woodworkers and available with your choice of paint and trim colors and a wide range of lifetime architectural roof shingle colors. Additional optional doors and windows are available to meet your specific requirements. Bayhorse garage prices include setup, installation and standard delivery within 25 miles of our Red Hook, NY location. Sales tax is not included. Please contact us for information about garage delivery fees beyond 25 miles of our Red Hook, NY location and any applicable sales tax amount. 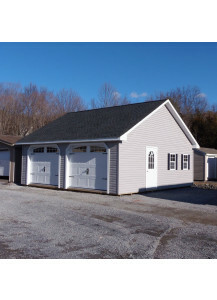 Garages are also available with pine clapboard siding, pine board and batten siding and LP SmartSide clapboard siding. 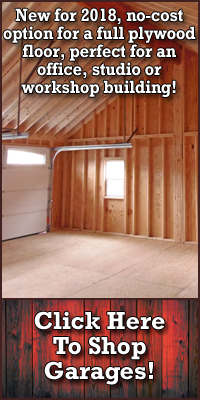 Garages can be installed on Elevated Knee Walls for an additional charge of $2.00 per square foot. Stamped Building Plans for each garage model are available upon request for $350.00. 7/12 A-Frame "Cape" two-car, one-story build-on-site Duratemp garage measures 20' x 20' and comes with two 8' x 6'6" insulated carriage-style garage doors with sunburst. A-frame roof is 7/12 pitch. * The Cape garage shown in the photo is our 24' x 24' Cape display model with flint vinyl siding, white trim and black lifetime architectural roof shingles. Stop by our Red Hook, NY location to walk through the display model and look at choices for siding, paint colors, roof shingles and other options. 7/12 A-Frame "Cape" two-car, one-story build-on-site Duratemp garage measures 20' x 24' and comes with two 8' x 6'6" insulated carriage-style garage doors with sunburst. A-frame roof is 7/12 pitch. 7/12 A-Frame "Cape" two-car, one-story build-on-site Duratemp garage measures 20' x 28' and comes with two 8' x 6'6" insulated carriage-style garage doors with sunburst. A-frame roof is 7/12 pitch. 7/12 A-Frame "Cape" two-car, one-story build-on-site Duratemp garage measures 24' x 24' and comes with two 9' x 7' insulated carriage-style garage doors with sunburst. A-frame roof is 7/12 pitch. 7/12 A-Frame "Cape" two-car, one-story build-on-site Duratemp garage measures 24' x 28' and comes with two 9' x 7' insulated carriage-style garage doors with sunburst. A-frame roof is 7/12 pitch. 7/12 A-Frame "Cape" two-car, one-story build-on-site Duratemp garage measures 24' x 32' and comes with two 9' x 7' insulated carriage-style garage doors with sunburst. A-frame roof is 7/12 pitch.